We have so much in common.... I like food too! I really love food as well...but, now I feel that I need to eat healthier. Something about the happiness that is McDonald's French Fries. I read the manga Kitchen Princess. The author said she liked to make omelets with chicken fried rice.Tried it.Liked it. Now I'm eating it a couple of times a month! 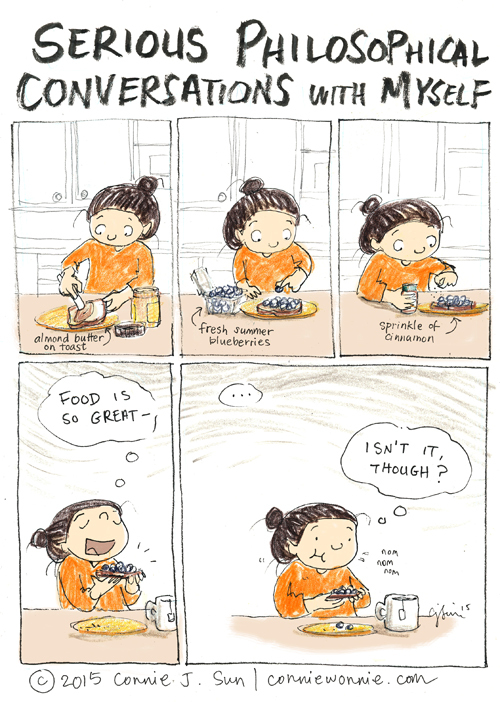 Comics and comic strips are now becoming my source for new food ideas! @Carl S.: Try Noriben, Japanese lunchbox fare extraordinaire! Combine about a quarter cup (a good handful) of dried bonito flakes) with a tablespoon or so of soy sauce. Tear up a couple of 3 x 5 in sheets of toasted nori seaweed (I'm partial to Edo brand, but whatever you can get). Now, put a serving of fresh, hot rice in your bento box (or a bowl), top with the bonito flakes and then cover with the torn nori bits. Cover and let stand for a few minutes, till the seaweed softens. Nom nom nom. I picked it up from anime.